KEITT, Laurence Massillon, a Representative from South Carolina; born in Orangeburg District, S.C., October 4, 1824; pursued classical studies and was graduated from South Carolina College (now the University of South Carolina) at Columbia in 1843; studied law; was admitted to the bar in 1845 and commenced practice in Orangeburg; member of the state house of representatives, 1848-1853; elected as a Democrat to the Thirty-third and to the succeeding Congress (March 4, 1853-July 16, 1856); censured by the U.S. House of Representatives on July 15, 1856, for his role in the assault made upon Senator Charles Sumner of Massachusetts on May 22, 1856; resigned on July 16, 1856; elected in a special election to the Thirty-fourth Congress to fill the vacancy caused by his own resignation, and reelected to the two succeeding Congresses (August 6, 1856-December 1860); chairman, Committee on Public Buildings and Grounds (Thirty-fifth Congress); delegate to the secession convention of South Carolina; member of the provisional congress of the Confederacy in Montgomery, Ala., in February 1861 and in Richmond, Va., in July 1861; raised the Twentieth South Carolina Regiment of Volunteers and was commissioned its colonel on January 11, 1862; subsequently promoted to the rank of brigadier general; wounded in the Battle of Cold Harbor, near Richmond, Va., and died as a result of his wounds the following day, June 4, 1864; interment in the family cemetery, near St. Matthews, S.C.
Papers: 1855-1864, 146 items. Correspondence relating to personal matters, politics, and the Civil War. Herd, Elmer Don, Jr., ed. 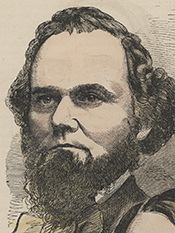 "Laurence M. Keitt's Letters from the Provisional Congress of the Confederacy, 1861." South Carolina Historical Magazine 61 (January 1960): 19-25. Keitt, Laurence Massilon. Speech of Hon. Lawrence M. Keitt, of South Carolina, on the origin of slavery; delivered in the House of Representatives, May 24, 1858. Washington: Printed at the Office of the Congressional Globe, 1858. Merchant, John H. Jr. "Laurence M. Keitt: South Carolina Fire Eater." Ph.D. diss., University of Virginia, 1976. Walther, Eric. H. "Palmetto Recklessness and Daring: Laurence M. Keitt and Louis T. Wigfall." In The Fire-Eaters, pp. 160-94. Baton Rouge: Louisiana State University Press, 1992.